A supplemental product for urinary incontinence in dogs. Your veterinarian may recommend treatment with Proin® phenylpropanolamine hydrochloride (ppa). The active ingredient in Proin is an alpha agonist which is highly effective in the control of urinary incontinence. 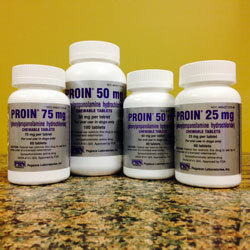 Proin is easy to administer on your pet’s food or as a treat. Your veterinarian will choose the formulation best suited to the needs of your dog. Often the dosage can be gradually reduced after the dog is stabilized. However, this condition is not curable and the need for ongoing treatment is likely. My dog had been leaking urine pretty badly...this stuff stopped it immediately!